Anmerkungen Eine Variante für einen Einzelspieler wurde unter dem Namen Smokey Joe herausgebracht. 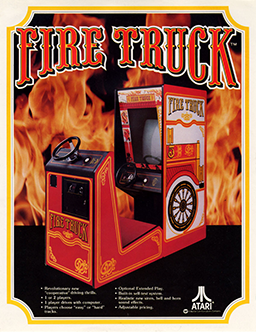 Fire Truck is a completely new video game concept. For the first time 2 players must "cooperate" to achieve highest score. An irresistible replay challenge. Two drivers work as a team to control a hook-and-ladder fire engine. One player drives the cab, the other steers the trailer simulating the excitement of an actual fire chase. The constantly moving city street, the challenge of keeping the cab and trailer driving together provide new thrills every time the game is played, as drivers race the clock to cover as much distance as possible. Quick reflexes for both players are a must to avoid crashing into curbs, oil slicks and other obstacles and losing time.